Keep Your Raspberry Patch Weed Free with Mulch. How I keep my Raspberry Patch weed free all year round. 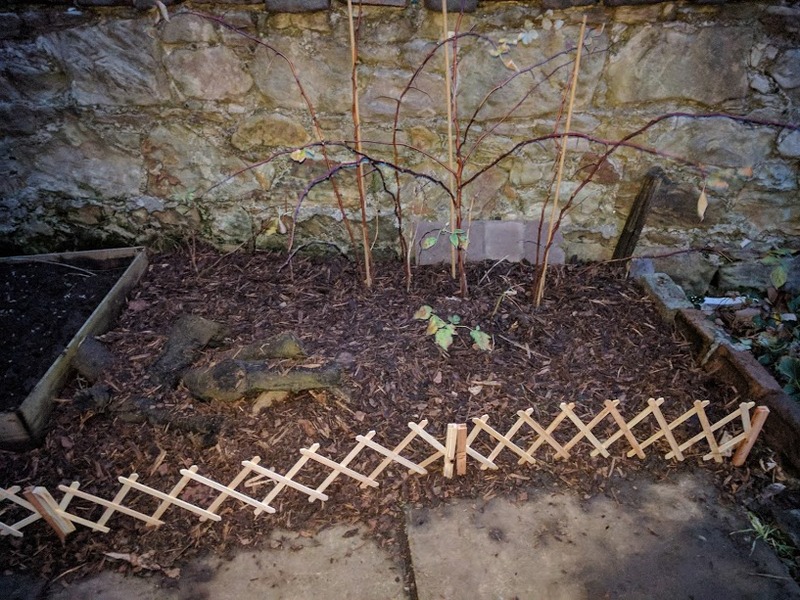 This time last year we planted some Raspberry canes in a previously unloved part of the garden. 1st year Raspberries never usually amount to much but there was 3 or 4 fruits per plant, they were excellent. I lost count the amount of times I picked out weeds, I admit, I gave up by Autumn. WE HATE WEEDS! As well as looking bad they take nutrients from our Raspberry plants and can harbor pests & diseases. This year, I said, no more! 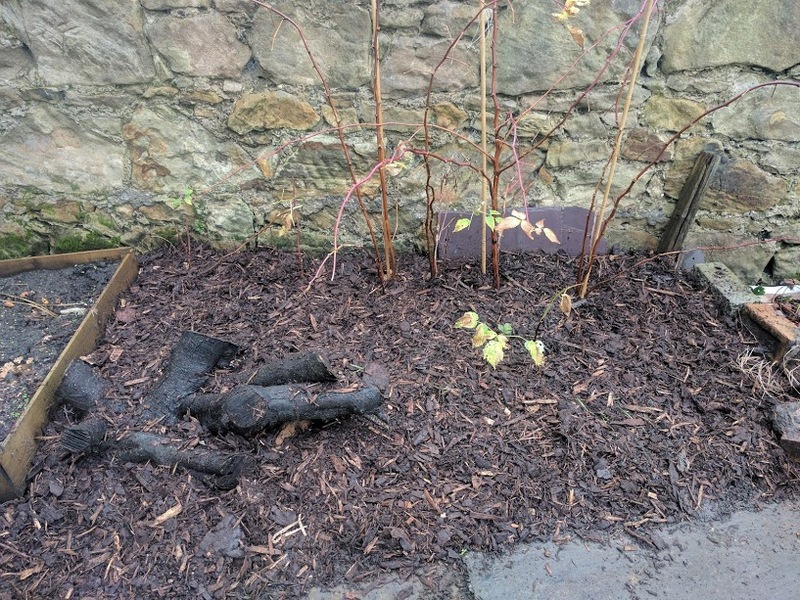 For less than £10 I was able to create a lovely mulch that will keep the weeds away for 1 year or more. The best part? It took less than an hour. What do I need, how much will it cost? Some cardboard boxes, flattened out. Double wall boxes last longer. Newspaper works too, it won't last as long though. Small bark Mulch. Make sure you get the smaller sized stuff. B&Q, B&M, Homebase etc all sell. For this we used B&Q Verve 100L, this is our first time using this product. Shop around, Aldi, B&M & other outlets often have special offers on throughout the season. Some chicken pellet manure or other suitable slow release fertilizer such as blood, fish & bone. Gardening gloves, a hoe or rake & a spade. I went with a hoe and up rooted all the current weeds. 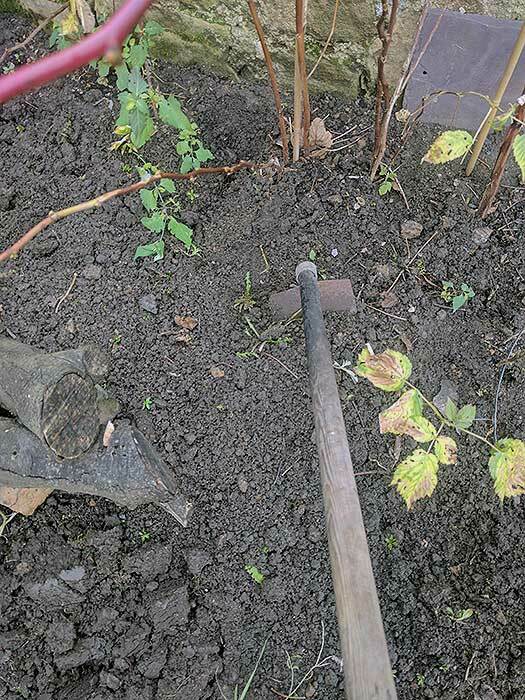 Take care around the Raspberries as they have shallow roots. Try to pick out all the current weeds. A hoe makes it easy but I still had to bend down and get the larger ones out. This gives our mulch the best chance of success. All currently growing weeds will at least be weakened and once smothered they will die. Loosening the soil also makes the next part much more efficient. You should fertilise the area around Raspberries in Autumn and Spring, I use chicken manure pellets but blood fish & bone works too. A small handful is more than enough. Don't worry about using to little as you can always fertilise throughout the year with liquid fertiliser. Spread the fertiliser around the raspberry roots (or where you imagine them to be). 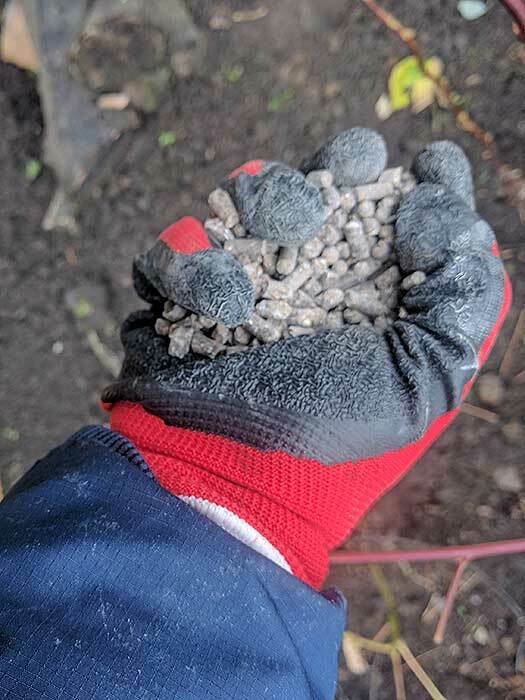 The pellets will break down and enrich the soil. Any slow release plant fertiliser or compost will work too. 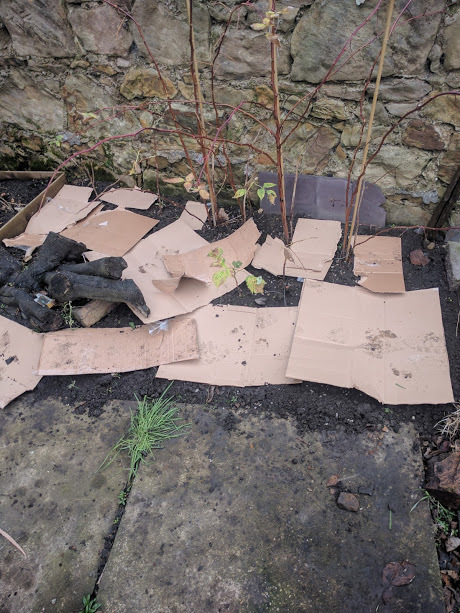 Cardboard is a great base layer, it will store moisture, block out weeds and last much longer than newspaper, which also works. Flatten out all the boxes and slot them around your raspberries. Leave at least 4 inches of space between the base of the stem and box. At this stage you can also add some weed free compost. Stand on the boxes to flatten them down & get them into position. Newspaper can be used to fill in any smaller gaps. Step 4 - Get the hose out and water it! Give everything a good watering. Now that you have more layers it will take longer for water to reach the roots of your Raspberries. By watering now and layering the bark on later you can lock in the moisture and increase heat, often resulting in earlier fruiting times. 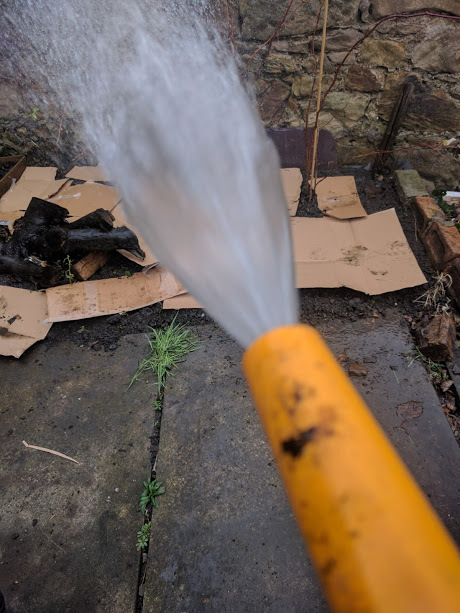 It's wet and cold here in February so I am only going to water a little, enough to keep the cardboard in place because it's windy too! During drought periods or dry hot spells, water thoroughly. Bought from B&Q, 100l, Verve. It is the smaller sized bark, £6.98. You can buy it cheaper elsewhere. Aldi usually have good deals. A pair of hard wearing gardening gloves is a must for this job. You could also use s﻿﻿tone﻿﻿s﻿﻿﻿, pebbles, hay or just plain compost at this stage. I like bark, it's cheap and works well. Spread it out evenly and leave a 2-3 inch gap between the base of the stems and the bark. If you go to close it will rot the root system and stem, killing your raspberries. 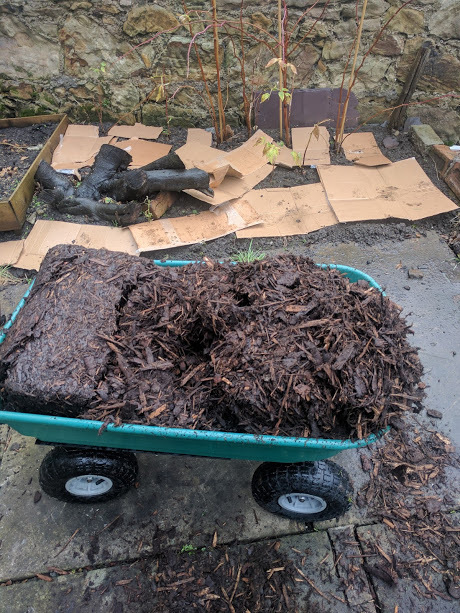 If you get it 5-6cm thick it should last for at least 1 year, you can buy additional bark and just cover any new bare soil with a couple of handfuls. This is called "topping up". Read more : W﻿hat are the benefits of mulching? These little garden trellis fences are available at PoundLand, they are rather flimsy and I doubt they will last a year but for £1, who can grumble! We'll update this post throughout 2017.